Trader Who Predicted Last Week's Carnage Now Sees Risk Of Explosive "Blast To The Upside"
Having correctly predicted (and explained) the broader market dump last week, and - more importantly - accurately defining the key CTA selloff levels much to the embarrassment of some of his peers who keep making wrong calls and, unable to make an accurate forecast for months instead chose to blame "fake news", Nomura's Charlie McElligott is out with an unexpected warning this morning, just as speculation of broad based capitulation is finally gripping markets. Furthermore, the proximity to the year-end “shut-down,” which means active/fundamental hands are largely “tied” and not in position to chase into an upside Equities trade this calendar year, the "chop" is not yet done according to McElligott. But, as the Nomura quant adds, there is scope for something developing thereafter, counterbalanced by the peak of the China slowdown in 1Q/2Q19 and it’s “drag” on global growth and inflation. Commenting further on the first bullet point, McElligott points out the dramatic repricing in rate hike odds seen last week, when Eurodollar futures volumes exploded to a record high, and notes that rates capitulation is “maxing”—EDZ8-Z9 now only pricing 10.25bps of hikes next yr / Mar 19 hike probability is now just 25% likely, while EDZ9-Z0 now shows -13.5bps of FED EASING in 2020." Arguably his strongest argument, one also made last week by Jeff Gundlach, is that there were simply "MASSIVE shorts" in the front-end which facilitated this beyond-epic trade unwind, i.e. a much discussed position (and one of many similar structures in the market) accumulated across the first half of 2018 where somebody was long approx. 900k long-dated red and green Eurodollar options Put ratios, "which has embedded enormous gamma-risk in the market and thus exacerbated the insanity of the short-squeeze (and corresponded talk of ‘stop-outs’ through buyside fixed-income pods in recent weeks)." Finally, when evaluating yield curve signals, it's not just the violent squeeze on the short end, but also rising organic demand for the long end: this according to McElligott was due to larger entities (as per the “Others & Non-Reportables” category of long-end futures OI data) now again buying the long-end. And while McElligott also comments on the limited upside in the USD, what we find most interesting - and his competitors most controversial - is the latest CTA positioning. According to McElligott CTA positioning, much of it exhausted to the upside, confirms similar USD length "which could also boost risk assets / inflation expectations on potential deleveraging." 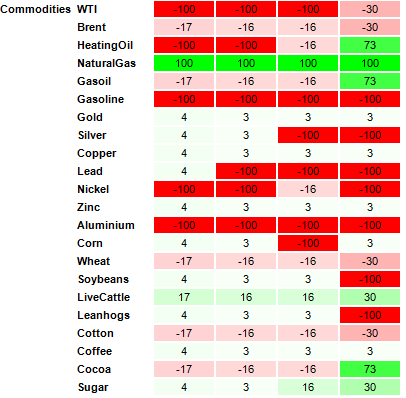 Further to potentially bullish CTA positioning, Nomura notes that "as a bullish (risk) “tell” and against this legacy “Max Long” Dollar position in the market (vs broad G10), we are beginning to see Commodities positioning pivoting back towards “Neutral” vs broad “Shorts” just one-month ago—this is another signal of potential upside for inflation expectations, especially as “trade-war thaw” begins to seep into US Aggs as China flips the switch and resumes purchases of US ags and energy, where a gradual daily improvement on continued “tangible” improvement with China buying can boost generalized risk-sentiment further." As such, using the S&P as chief equities proxy, McElligott would see CTA Trend begin to cover and “flip” LONG again at 2667—with potential estimated notional on the cover from “-100% Max Short” to go back a “+21% Long” position (based off of Friday’s closing spot level—which, as he reminds, these estimated levels are not static). In short, S&P CTA are currently -100% "max short", but would be buying over 2,667.54 to get to -39.5% - a buying volume of $45BN - and another $45BN at 2,667.8 to get to 21% long, with the model estimating "Max Long" accumulatve above 2,771.6. It's not just trend-followers who are positioned for a bullish reversal: so are trading desks, with McEllgiott calculating that the SPX/SPY net Delta is now -$451B (and front-month -$306B of that as hedges are held and “kicked in”) but notional bias is to the upside." That said, offsetting this upward bias, we are also back to negative Gamma, with the move per 1% move + or – now -$9B and across strikes bias to downside. Finally, the key S&P levels that matter for "Greeks" are the 2600 strike with $4.4B gamma and 2650 with $4.3B gamma, "although that 2500 strike is ‘creeping’ with $3.0B of gamma." In parting, McElligott does a post-mortem of the Friday equity flush, noting that it was consistent with that of “risk management” -dictated behavior (especially due to the proximity to year-end), with funds showing zero tolerance for further drawdown: by the end of the day, Equities Long-Short and Market-Neutral performance looks to have made fresh YTD lows. However, contrary to some erroneous report in the financial press, Friday’s exposure reduction wasn’t about a broad “gross-down”, and instead it was about taking down your “nets” (long exposure less short), with popular longs being “hate sold” while at the same time seeing shorts pressed hard in a clearly more defensive posture as funds look to “shut it down” through the end of the year. In short, another day in which the "max pain" was to the downside (sorry JPMorgan quants).